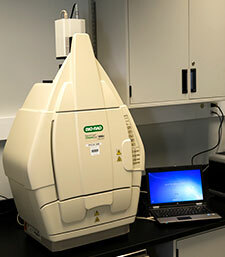 Description: The ChemiDoc XRS+ system is based on CCD high-resolution, high-sensitivity detection technology and modular options to accommodate a wide range of samples and support multiple detection methods including fluorescence, colorimetry, densitometry, chemiluminescence, and chemifluorescence. The system is controlled by Image Lab software to optimize imager performance for fast, integrated, and automated image capture and analysis of various samples. The system accommodates a wide array of samples, from large handcast polyacrylamide gels to small ReadyAgarose gels and various blots. The system is an ideal accompaniment to PCR, purification, and electrophoresis systems, enabling image analysis and documentation of restriction digests, amplified nucleic acids, genetic fingerprinting, RFLPs, and protein purification and characterization.